As part of YAshot bloggers tour, Sally Nicholls, author of Ways To Live Forever, Close Your Pretty Eyes, and most recently An Island Of Our Own, guest posts on MinervaReads. Sally is a Waterstones Children’s Book Prize winner and a Carnegie Medal nominee, and I am delighted and proud to host her writing today. You could say the idea for An Island of Our Own begins in a library. It is 1996. I am twelve years old, and a student at a small, failing, private school in North Yorkshire. There are ten other children in my class. There are probably lots of educational advantages to being in a class of eleven children, but as far as twelve-year-old me is concerned, they are all outweighed by a more pressing disadvantage; namely, that there are five other girls in my class, none of them are very similar to me, and they all have a best friend already. Our class are supposed to hang out in our form room at lunchtime, but if there’s one thing worse than not having any friends, it’s not having any friends publicly, so I don’t. I go and hang out in the library instead. As an author, I visit a lot of school libraries. They are, generally, large, bright, well-stocked places, full of computers and new books and children. The library at the school I go to at 14, when my small, failing private school finally fails, and I am moved to the local comp, is like that; cheerful, well-run and extremely well-used. This library is two small rooms, full of books, most of which are look at least thirty years old, some much older. There is no full-time librarian, just a notebook, in which you write your name, when you took a book out, and when you return it. There are very few children’s books, in my memory at least, although in my school’s defence this is partly because each English classroom also has one of those bookcases on wheels full of more recent purchases. The library is not where the Anne Fines and Beverley Naidoos and Robert Westells live. It is where the old books retire to gently moulder. And it is, almost always, completely empty, except for me. I don’t get most of my books from this library. At twelve, I am obsessed with science fiction and fantasy, Terry Pratchett and Isaac Asimov and Anne McCaffery, whose books include a lot of children, as though she’s half aware that a lot of her readers, like me, aren’t quite ready for the world of adult fiction yet. I get most of my books from the local library, who have been ordering in complete series for me free of charge since the day I discovered Enid Blyton. I lug enormous hardback Tad Williams books around in my schoolbag, and occasionally attempt to read them under the table in Biology, with mixed results. But I do borrow some books from this library. It’s here that I first read 1984 and Animal Farm. It’s here that I discover that the woman who wrote The Secret Garden wrote another book about a little princess in a garret, one of the few children’s books in the place. And it’s here that I hit a goldmine; a whole shelf of hardback Nevil Shutes. I had discovered Nevil Shute some years earlier, when my mother mistakenly allowed us to watch the TV adaptation of Pied Piper, believing it to be a children’s story about rats in Hamelin, discovered her mistake when we were far enough in to be interested in the children in the story, regretted it when we were treated to a shot of a roadside littered with corpses, and decided – knowing the book – that the best thing to do was keep going until we got to the happy ending. My mother lets me read anything I want, but is quite strict in what I am allowed to watch, so this – quite mild – brush with Nazi interrogators and dead bodies stays in my memory. And when I find the book while staying with one of her friends, I read and enjoy it. So I trust this shelf of Nevil Shutes, and I read them, despite the lack of elves and robots. Some rather bore me. I am a lot less interested in aeroplanes than Shute is. His rather melancholy portrayal of mid- and post-war Britain depresses me – it is a melancholy I am not yet old enough to understand. But what I love is the ordinariness of his heroes, especially when he dumps them in hair-raising life-or-death dramas. The shy, ugly, socially inept aeronautical engineer who finds himself, mid-Atlantic, on a plane whose tail is about to fall off, and can’t persuade anyone else to believe him. The typist from Perivale who not only saves a collection of female POWs from the Japanese, but goes on to turn an Australian outback village into a town like Alice, pretty much solely because she wants somewhere nice to live. And the elderly fisherman in Pied Piper who rescues twelve children from occupied France, more-or-less by accident. And Keith in Trustee From the Toolroom. I love Keith. Keith is exactly the sort of hero you want when you are twelve, and shy, and keep failing at basic tasks like Wearing The Right Sort of Shoes. Keith has a nice life designing model engines in a nice little two-up-two-down with his nice wife. He is middle-aged and balding and completely unequipped for the plot Nevil Shute forces on him; rescuing some illegal diamonds from a desert island in Polynesia. But he gives it his best shot, because he’s nice, and because it’s important. And, rather wonderfully, he succeeds, not by derring-do and bravado, but because people all over the world remember small acts of kindnesses that he’s done for them (he’s much better at replying to fan mail than I am), and want to repay him. Trustee From the Toolroom is a book about the kindness of strangers. Like all of Shute’s heroes, Keith succeeds because he’s kind, and conscientious, and a bit dorky, not despite it. An Island of Our Own is my homage to that book. It’s a homage to heroes who are ordinary (several bloggers said shy, geeky Jonathan was their favourite character, and I love that), and who achieve their (slightly fantastical) goals because of their ordinariness, not despite it. It’s about using technology and the internet to solve problems, partly because I live on the internet, and I think it gets a bad rap, and partly because Shute would have loved it even more. And it’s a love letter to the kindness of strangers, something that, when the internet gets right, it is glorious at. Kindness. Libraries. Ordinary people. That’s three of my favourite things right there. 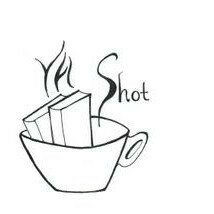 For more information on YAshot please click here. With special thanks to author Alexia Casale, who put me in touch with Sally Nicholls. To purchase any of Sally’s books, please click here and scroll to the bottom of the page.